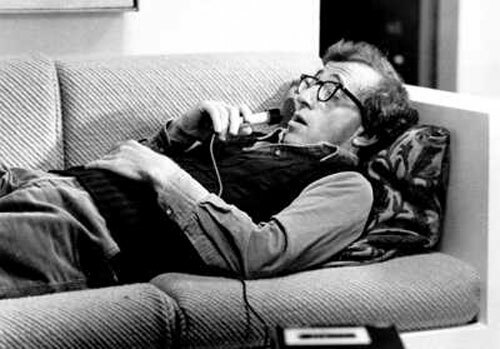 Woody Allen talks to an analyst in "Manhattan"
While riding on the bus or the "L," have you ever seen an ad for a psychological center (are you depressed? anxious? etc.) contemplated calling the number, then quickly averted your eyes, embarrassed that you even considered it? "Do I really need therapy?" you ask yourself, realizing in that very moment that yes, you really do. Then you wonder, "Am I the only person who has ever wrestled with these crazy thoughts? Am I crazy?" The truth is, you&apos;re not crazy, and you&apos;re not alone—you&apos;re actually one of millions. According to the National Institute of Mental Health, major depressive disorder (which you may just write off as a bad case of the blues) affects 14.8 million American adults each year. 5.7 million Americans have bipolar disorder, 2.2 million struggle with obsessive-compulsive disorder (OCD) and generalized anxiety disorder affects approximately 7.7 million. Depression and anxiety are the most common; and unfortunately, the most likely to be swept under the rug. "Man up," "Stop wallowing," "Stay positive," "Just eat," "Go for a run," "Try yoga," urge friends and family members, as if a brain can instantly be re-wired with a positive attitude and some downward dog. These magic cures may work for some people; but for those with chemical imbalances or deeper issues that a good balanced breakfast and a walk in the park can&apos;t fix, therapy (combined with psychiatric medication as needed) could work wonders. Does the steoreotypical image of lying on a couch and telling your life story to a wizened old analyst not sound like the most appealing option to you? Fortunately, psychoanalysis is much more complex, involved and helpful than film and television often make it out to be. Also, modern therapy methods can be tailored to your specific issue, whether it be depression, anxiety, an eating disorder, alcoholism, co-dependency in relationships or all of the above. Therapy also comes in a variety of different forms, from individual appointments to support groups to family counseling sessions, many of which are fully or at least partially covered by insurance. Most therapists also have connections to psychiatrists, nutritionists and general physicians to treat any physical symptoms that may arise. Stigma around mental health care still exists today; but the more informed people are about the diverse symptoms and proper methods of treatment for mental illness, and how billions of people around the world are affected every day, then they are much less likely to judge. If you are physically sick, then you got to the doctor to get well again. So, why feel shame and guilt about seeing a therapist for your mental health? If you want to talk to an unbiased professional about whatever you may struggling with—whether it be a recent breakup, a death in the family or a quarter-life crisis you just can&apos;t seem to shake—go ahead and make the call. Asking for help is not a sign of weakness; it&apos;s a sign of strength. To find therapists in private practice, visit therapists.psychologytoday.com or contact the counseling center on your college campus. Has therapy had a transformative effect on your life?